Lymm’s Bugler Smith has appointed Simon Broadbent as its new Creative Director. Broadbent has almost 30 years’ experience in the creative industry, having worked with clients including Matalan, Next and The Co-operative. He has previously held roles at TBWA and Amaze. MD Lee Ashton said: “Simon’s creative talent and award-winning experience will play a key role in our next phase of planned growth. He joins at an exciting time for the agency, and will support our ethos, of making the formal informal, and reputation for delivering outstanding creative output. He is joined by two other senior hires. Stephanie Fisher joins as head of social strategy within the PR and social team, while senior account manager Danielle Coletta arrives after spending five years as marketing manager at Just Eat. 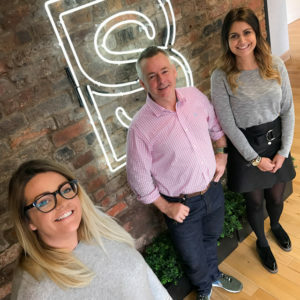 Ashton added: “The additional appointments of Stephanie and Danielle will add strength to the account management and PR and social teams, which have both grown significantly in the last two years. “Stephanie’s appointment strengthens the PR and social team, boosting our social offering, to support our integrated approach to campaigns. With fantastic experience of delivering digital and experiential activity, Danielle will add further experience to the account management team. The privately-owned business works for clients including Pets at Home, Rentalcars.com, Ripe Insurance and Vets4Pets.